You brush your teeth twice a day, floss every night, and visit your dentist every 6 months to keep your smile healthy. With your proactive approach, you never expect a complication to compromise your oral health. 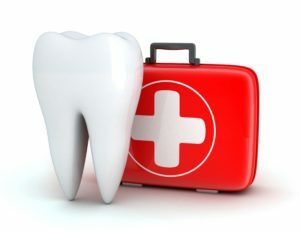 Unfortunately, even with the best preventive measures in place, a dental emergency can occur when you least expect it. In fact, 1 in 6 Americans faces one every year. If you find yourself in this situation, time is of the utmost importance. You need to call your emergency dentist in the Lehigh Valley right away and provide first aid at home to save your smile. Dental emergencies can take many forms, making it difficult to determine what issues require immediate care. If you are unsure, do not hesitate to contact your dentist. While you wait for your appointment, there are several steps to take at home depending on the problem you are experiencing. Hold the tooth by the crown and rinse it with cool water. Be careful not to touch the root and do not use any soap or cleaners. Your tooth must be kept moist, so do not dry it. Gently try to reinsert it back into the socket. If you are unsuccessful, place it in a cup of milk. Carefully push the tooth back into position and bite on a piece of gauze to prevent it from moving. A minor toothache can be managed with an over-the-counter pain reliever, but you must still visit your dentist to find the underlying cause of your discomfort. Severe toothaches can be a sign of an infection and require immediate care. Besides a pain reliever, rinse your mouth with warm salt water. Rinse your mouth with warm salt water and apply a cold compress to the outside of your face to help with swelling. Take a pain reliever to manage your discomfort. Avoid chewing or placing pressure on the tooth until after it is repaired. Never try to bond a loose restoration back in place because it can cause bacteria to be trapped underneath it. Instead, keep your tooth clean and avoid chewing on it. Use a piece of dental floss to try to dislodge the object. If you cannot, do not use any sharp or metal instruments to try to get it out. Instead, wait until your dental appointment. As with any emergency, those that affect your oral health require immediate care. If you wait too long, it could cost you your tooth. Call your emergency dentist right away for a same day appointment. Dr. S. John Salivonchik has provided comprehensive dental care for over 20 years. He offers the exact services his patients need through all stages of life. Dr. Salivonchik is always there for his patients to help them maintain optimal oral health, even during times of emergency. If you have a dental emergency, contact our office today to schedule an appointment.